Hurom's new personal series juicer will meet all your juicing needs. Whether you're making orange juice, almond milk or sorbets, the HP will rise to the challenge. It's compact size further ensures it will fit on any kitchen counter. Peace and quiet: A nearsilent AC motor works efficiently using only just 150 watts of power. Yield: Hurom's unique lowspeed auger squeezes every drop of juice from foods resulting in bonedry pulp. Safety: Duplicate safety sensors allow the unit to operate only if the chamber is completely and accurately assembled on the base. A builtin cooling system with integrated heat vents prevents overheating. The chute is sized to keep even small fingers out. 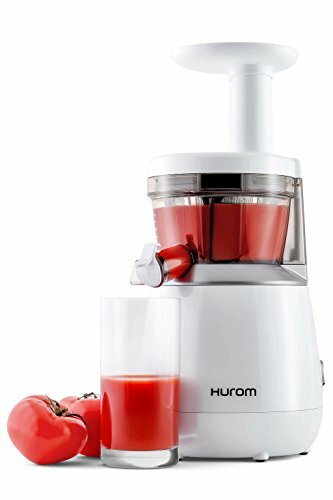 Most importantly, no blades are used in Hurom juicers. Quality: Hurom's HP isn't all looks. It handles years of daily use. Hurom's heavyduty Ultem strainer and auger are 8x stronger than traditional plastics. The HP has subtle, sweeping curves that will mimic the beauty of its new owner. It holds less juice than other models, but it also takes up less space.